I work in a medical center whose parking lot is only accessible through a residential neighbourhood. This neighbourhood has a lot of restrictions on turns during rush hour, including a very convenient turn onto a main street between 4-6pm. Of course everyone who works there makes that turn constantly... It's just the most convenient way to get home. Rush hour traffic is pretty bad though so people usually only manage to make the turn when there's a break in it. Well I'm no exception and usually make that "illegal" right turn on the way home. Today after 2 years of working there, I finally got unlucky. I was first up to the plate right around 5pm, there was a break in the rush hour traffic so the road was absolutely clear, made the turn and ran right into a police trap around the next corner... turns out a resident had complained and he was sent to hide in the bushes and ticket drivers making that turn. There were at least two people pulled over ahead of me and he pulled over 2-3 other people behind me who made the turn at the same time. I'm not at all concerned about the fine or the demerit points... it's the insurance that will screw me over. Is there any realistic way of bargaining this down to a by law offence or something that won't show up on my driving record? You might get a plea deal to some lesser charge, but it would still be some kind of traffic violation and still affect your insurance. I would plead NOT GUILTY and request a trial with the officer(s) present. Once you get your Notice of Trial with the trial date on it, you can then request disclosure (copy of notes of all officers involved). Once you get disclosure scan and post it here with personal info blocked out. You could also scan and post the ticket with personal info blocked out and we can check for fatal errors. Was there more than one officer involved (one watching for people making the turn and another pulling them over and writing tickets)? jsherk wrote: You might get a plea deal to some lesser charge, but it would still be some kind of traffic violation and still affect your insurance. As far as I could tell, there was only one officer. After the "illegal" turn there's one traffic-light intersection after ~40m, and then a bus bay after that. The cop was in one of those very lightly marked police cars pulled into the bus bay. After I made the turn I signaled and switched over to the left lane because the way was clear. He walked out into the middle of the street from the bus bay and pulled me over into it. c) if i request a trial and he doesn't show up the ticket will be thrown out. Do you think the fact that the sign is overwhelmingly unenforced could be used as a defence to get the ticket thrown out or at least reduced to a non-HTA offence? I will post the ticket as soon as I can. HMRCAF wrote: Do you think the fact that the sign is overwhelmingly unenforced could be used as a defence to get the ticket thrown out or at least reduced to a non-HTA offence? No! Being unenforced is completely irrelevent and won't help you at all. The prosecutor may offer you plea deal to some lesser charge, but usually it will still be an HTA offence that will still affect your insurance. Your best bet is to review the officers notes and then decide whether to just plead guilty and pay it, or to fight it. You have nothing to lose and everything to gain by pleading not guilty and requesting disclosure. I am definitely pleading not guilty. At first I am going to have an early meeting with the prosecutor, but if they can't knock it down to a municipal offence then I will go to court and request disclosure. One thing else to note is that I was carrying an "old" driver's license which I showed the officer, by which I mean I changed the address but hadn't received the new one yet. I forgot to show him the piece of paper that showed my new address because I was a bit frazzled about being stopped. I will inform the court of my new address when I go to submit my early resolution meeting. I have another question, will this ticket affect my ability to travel internationally? Tickets like this one are Provincial Offences and are NOT Criminal Offences so no they do affect your ability to travel. Just be aware that prohibited turns are one of the few bylaw offences that can actually appear on your driving abstract and still result in demerit points being applied to your licence. Many posters have reported that municipalities don't typically notify the MTO of convictions for these offences, but just be aware of the possibility. and the "dash" between Mon - Fri was covered up by a bolt. Could I use these facts to have the sign declared invalid? Here is a google street view image of the sign in question. 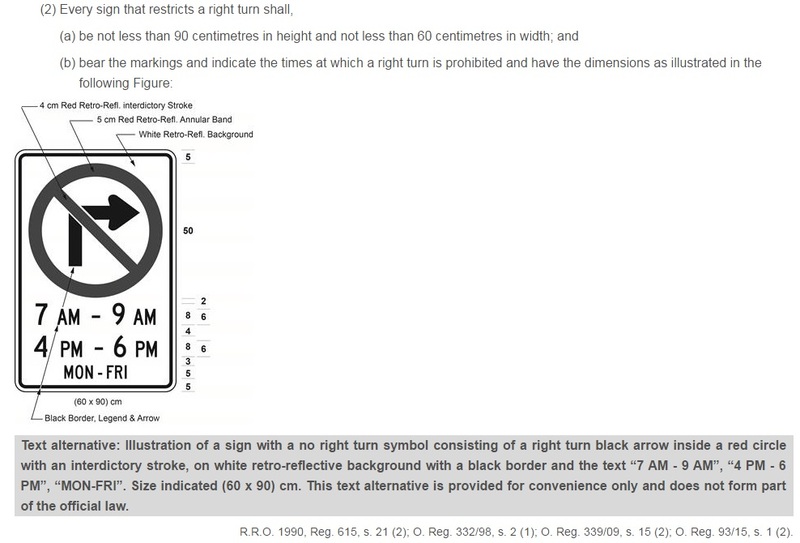 And here is the link to the regulation on "prohibited right turns"
I think you'd be hard pushed to argue that you were not aware what this sign meant. Can I argue that failing to obey a sign is strict liability in the case that the sign itself is misleading? I don't think that misleading is what you need to look for. You need to get the justice to agree that the sign doesn't match the requirements of the regulation. If they do then the sign is invalid. Personally I don't see it but keep us posted. Or b) if the sign is valid then it only prohibits turns at 4pm and 6pm, not between the two, as there is no dash which typically signifies a range of times on official signage. I had a brief chance to speak with the prosecutor. She asked if I made the turn in question buti refused to comment. I mentioned that there may have been an issue with the sign that made it invalid. She said that "valid" wasn't a legal term and that the sign could have been written in crayon on cardboard and it would still be a legally applicable sign. Can anyone comment as to how true this is? I have three copies of a photo of the sign taken after I was ticketed, I also have a printout of a Google maps screenshot showing the sign was like that even before I was ticketed. Thank you all for your advice so far. With the same logic, you could argue that it applies only on Monday and only on Friday as well. However I do not see anything in that regulation that says the dash has be there. The "Text Alternative" at the bottom specifically says it is only there for convenience and does not form part of the officical law. It certainly won't hurt to make your argument, although I think you will have a very hard time convincing the JP. Did you get dicslosure of officers notes yet? Yes, I could also argue that, but I don't think I will unless I have to. It doesn't say the dash has to be there but the image itself forms part of the law, and typically, when a range of times is provided on official signs there's a dash to signify it, and when there is a list of times, there is no dash. I could argue that the sign could be interpreted in that way. If all else fails I could try to bring up the French Language Services Act to claim the sign is invalid, but I think that would be even weaker. I have the disclosure here. 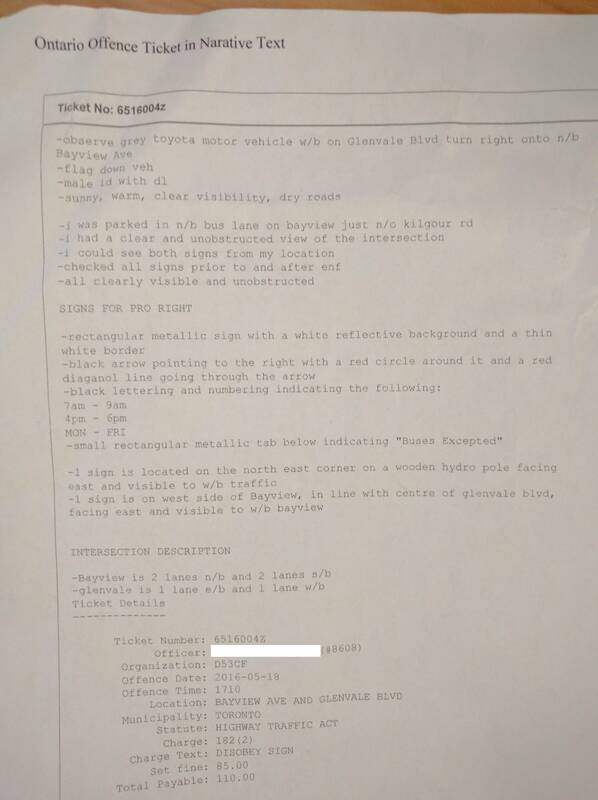 There's another page but that just has accurate information on my vehicle (license plate, make, missing model year though) and "Additional Information": Motor Vehicle Involved Y, Collision Involved N, Witnesses N, MMQ Book Notes w/ Evidence N, No in car video or audio recordings, no related tickets. Do you think, in this case, I'd be able to argue for a charge to be laid under Toronto Municipal Code Article 5, Section 950-504? I could argue that this is the bylaw that actually does prohibit the turn at this intersection in the range of times between 4pm and 6pm and thus I should be charged under the TMC instead of the HTA. And if I understand correctly, insurance companies can't use bylaw offenses to raise your rates. The officers notes about being able to see both signs from his viewpoint is irrelevent because he says he checked the signs were there both before and after enforcement. So as long as he could see your vehicle turn onto Bayview, that is all that really matters. Whats the actual charge you were charged with? To argue the charge be made under TMC instead, would be something you would do before hand when trying to make a plea deal with the prosecutor. I like to fight everything, so I do encourage you take it as far as you can. However, short of the officer not showing up, I do not think you will win. So there is of course value in going to court and getting more comfortable making arguments, but given the high probability of losing, a deal to TMC might be a better choice.